Have you seen the witty washi tape magnets at Twirling Betty? I spotted the idea at Craft the other day and immediately had to try it out. I love fancy Japanese tape. And magnets that look like fancy Japanese tape. Read Christen's easy instructions right here. I stuck a white mailing label over the printing on my junk mail magnet and layered the tape on top of that, since there was no paper that would peel off. The label hid the printing. They're pretty believable, right? I'm always hoarding my washi tape-- now I can make it last forever (or at least a bit longer;)! 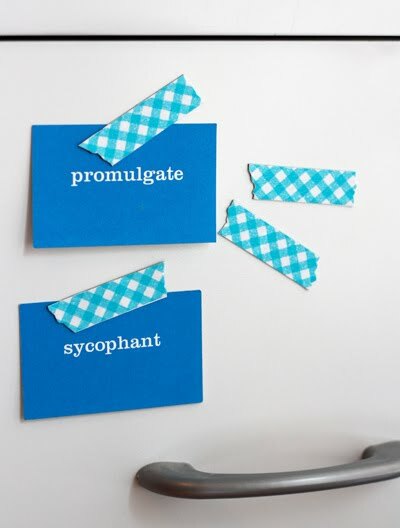 Umm, I love that you have the words "promulgate" and "sycophant" on your fridge. Oh, I love how these look! Thanks for sharing the tutorial. I still haven't broken down and bought any of the tape yet, but it will happen soon, I'm sure. that is awesome! now i can cover up those ugly southwest plumbing magnets we always get in the mail! these are so cute!!! I love'em! 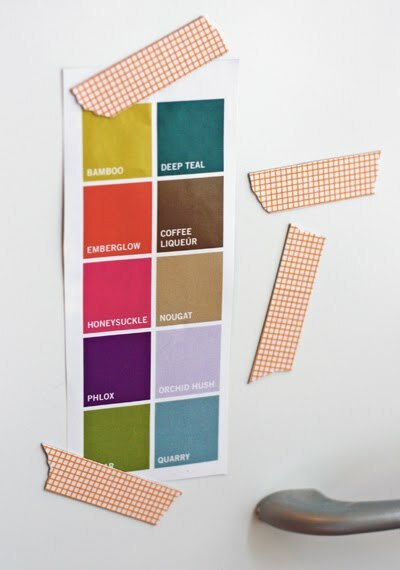 Love those color swatches (and the tape too, of course). Where are they from? I think I cut the swatches out of a Pantone article in Graphic Design USA. A color forecast report, I believe. This is really a cute idea. Never heard of washi tape. But going to have to find some. Thanks for sharing. This is the first of my ever hearing of washi tape, were do I get this wonderful product? You can find some sources in this post.